Change Your Life By Reprogramming Sub Conscious Mind ! The Subconscious mind is like a huge filing cabinet that stores all pleasant and unpleasant experiences, habits, visual images, information from your past lives, through birth to childhood and present adult life. The Subconscious mind is not immediately accessible by your Conscious (objective) mind. 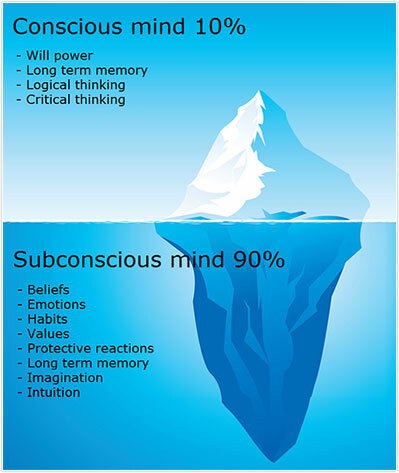 Without your Subconscious mind, you cannot recall your childhood experiences, past lives etc. It is also within the Subconscious mind that our habits, character traits, learned behaviours and beliefs including limiting beliefs are registered having being learnt through repetition and practice. Your Subconscious mind is the bridge between your body and Conscious mind. The Conscious mind on the other hand, helps us to generate thoughts and decide the path we wish to take. In other words, the Conscious mind makes decisions and gives orders to the Subconscious mind while the Subconscious mind carries out these instructions without questioning. The good news is that you can reprogram your Subconscious mind by inputting and reinforcing new positive thoughts, positive ideas and positive actions. 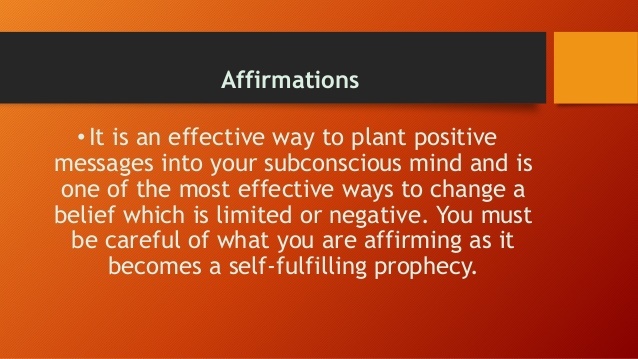 The use of Positive Affirmations helps the Subconscious mind to reprogram through repeated personal, positive, present tense statements that can override the negative belief or negative thoughts already registered. The repetition of these affirmations brings about new attitude while creating new pathways in the Subconscious mind. This also helps the Subconscious mind to start acting in those ways. For example, the repetition of “I choose happiness at all times” can change your mindset about anger or sadness. You should also avoid the use of negative words like 'I do not want trouble today'. Instead say, 'I want Peace in my life'. For an individual that wants to see success, visualisation is a technique that could enable you to create detailed mental pictures that depict a specific desired outcome. This is exactly the technique used by Innovators and idea generators when they are designing and creating new products that bring massive development into the World and you too can apply visualisation into your everyday life. These mental images so created, stimulate the Subconscious mind into accepting them as reality, while directing behavior as needed towards achieving the desired goal. Hypnotherapy is a therapy that works with the Subconscious mind as it enables the individual to achieve a state of extreme relaxation. The Subconscious mind is easier to access once you are in this state because the Conscious mind is able to release its grip. The Subconscious mind could be easily reprogrammed to accept new thoughts as reality while under hypnosis. The use of subliminal audios or videos is beneficial to the Subconscious mind whether done while asleep or awake. Just as the Conscious mind is listening to the music being played or the video being watched, the Subconscious mind is hearing the hidden information recorded underneath the audio or video. Bear in mind that your Conscious mind could distract this information from registering on the Subconscious mind if this is mostly done while awake. When you still your mind using Meditation techniques, you are consciously and unconsciously reprogramming your Mind and that's why Meditation is very important for this process. There are various techniques that you can apply during meditation which could involve incorporating visualisation and imagination as a point of focus for whatever habit you want your Subconscious mind to submit to. 'Will' is that part of us that moves us to respond passively or actively to a given situation. On the other hand, we can use our 'Will' voluntarily by being conscious of it or involuntarily by subconsciously taking some actions which are deemed beneficial to us. Habit on the other hand, is a mental or physical behaviour we have adopted and repeatedly apply in our lives without being conscious of it. For example, when you wake up in the morning and shower before going to work, it is because you have adopted that as a habit of cleanliness. However, nothing prevents you from going to work without having a shower. Considering that you have adopted this as a habit, you repeatedly do it without any second thought. Will and Habit are both mental processes that closely relate to each other. It is the same process we use in forming a habit that we could also apply to reprogram our Subconscious mind with any new behaviour which we intend to make a habit. Self- suggestion is one of the easiest ways we could use to consciously tell our Subconscious mind what we would like to see happen. Take for example, you would like to wake up at 5am in the morning in order not to miss your flight. You could say to yourself before going to bed that 'I want to wake up at 5am' and because this is a very important thing you wish to accomplish, you will agree with me that you will wake up even before that 5am in order not to miss your flight whether you set your alarm clock or not. Using these techniques can help you reprogram your subconscious mind while at the same time removing the excessive burden that long established negative thoughts have buried in it. You have the power to achieve this and you can make it happen. Get rid of your all emotional pains, irrational fears, anger, guilt, depression, disturbing thoughts, feeling blocked, emotional outbursts, low self-esteem, self-harm and other related issues thru powerful NLP / Hypnotherapy / Age Regression Sessions which are safe and effective. Skype / Google Duo sessions are also available. In Healing Sphere, Past Life Regression, Life Between Lives, Future Life Progression and Spirit Relese sessions are conducted by certified Past Life Regression/Hypnotherapy Therapist. The sessions are safe, peaceful and relaxing. Appointment may be taken for booking a session. Healing Sphere is a holistic healing centre based in Lucknow in India. The centre offers healing of mind, body and soul through a variety of new age healing techniques like Hypnotherapy, Past Life Regression, Inner Child Healing, Life between Lives (LBL), Spirit Release Therapy, Future Life Progression, Reiki, EFT (Emotional Freedom Technique), NLP(Neuro Linguistic Programming), Mudra Vigyan and Meditation. The centre follows holistic approach in which other healing therapies are also integrated. For example - with a typical Past Life Regression session, other healing therapies – Inner Child Healing, Reiki, Spirit Release Therapy EFT, and NLP are also used. The holistic approach gives a faster and lasting healing.